Successfully Added Ordro S11 Smart Sports Wristband - 0.87 Inch OLED Screen, BT 4.0, IP67 Waterproof, Pedometer, Heart Rate Sensor (Black) to your Shopping Cart. The fashionable Ordro S11 wristband is a sporty wearable with great functionality. 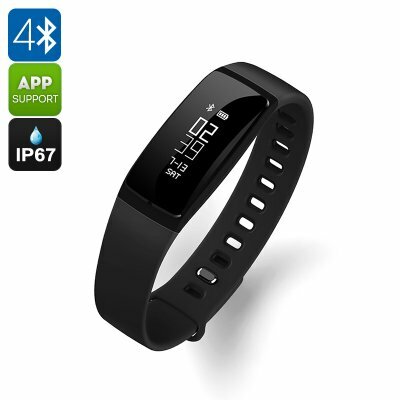 Heart rate monitor, pedometer, calorie counter and sleep monitor will let you keep track of your exercise and health. A compact 0.87 inch OLED display clearly shows all the information which can be scrolled through by tapping your finger on its sleek screen. When partnered with your phone you will also be able to receive call and message notifications. The Ordro S11 smart bracelet is compatible with iOS and Android devices you can pair it with almost any smartphone or tablet PC. A smooth and comfortable wrist strap hold this wearable firmly in place and hide the USB charging port that slips into the strap when worn. So you never need to worry about taking a charging cable with you as this fantastic smart bracelet won't require one and can be charged direct from your PC or laptop. This clever design feature also ensures an IP67 waterproof rating, so it won't be bothered by sweat or getting wet in the rain. With its 70mAh built-in battery, there's plenty of power for the whole day. A perfect way to stick to that new year resolution and at an affordable price. The Ordro S11 Smart Bracelet comes with 12 months warranty, brought to you by the leader in electronic devices as well as wholesale smart watches and wearable gadgets..
Works well, down loaded the H Band app off of the app store set it up in no time. Does a really good job of recording the steps I take in a day - and encourages me to walk more when the numbers are low! The text/phone/facebook message function works well, can even read the messages on the watch. I have checked the blood pressure function against a 'proper' blood pressure tester and it is surprisingly accurate.